Are you often traveling and have huge roaming costs for your mobile communication? Our solution is easy to use and can dramatically reduce your communication costs while traveling. It is actually prepaid service, designed to greatly reduce the cost of using your mobile phone when traveling. With SIM4TRAVEL you get a new number and SIM card that you place in your existing unlocked handset when you travel. With coverage in over 190 countries, great international roaming rates for calls, text and data and dedicated customer support, SIM4TRAVEL is an essential tool for you. You can also update your account online through the web all over the world. 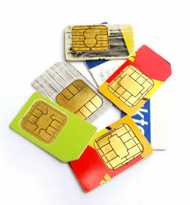 What is also very important, you will get two numbers on one SIM card. One starts with +423 and other with +49 which is actually country code for Germany. Those numbers also allows you to use your mobile phone for answering to call made on German number. That is appropriate if you want to have virtual presence in Germany, but actually you can operate from more than 190 countries.